Urban Horse promotes an Equine Fusion SLIM Fit Kit Hire Service - The Equine Fusion SLIM Fit Kit has been designed to help you find the correct size Equine Fusion SLIM hoof boots for your horses hooves. The Equine Fusion range of hoof boots are a revolutionary lightweight and simple hoof boot to use. Ideal for horses with slightly longer then wide / narrower hooves. Horse hind hooves as long as the size of the hooves are narrower then the length. The price charged is a DEPOSIT ONLY for 3 X SLIM EQUINE FUSION BOOT SHELLS. You will be refunded £35 (the price charged £45 less £10 admin fee). As most horses are within 1 or 2 sizes to keep down the return postage costs for the fit kit hoof boot hire service instead of sending out all 10 x different Equine Fusion SLIM sizes available for the UK we will send out 3 x as per your chosen sizes required! Your measurments will determine which size fit kit you need. For example, if your horse’s hoof measurements call for a size 12, order a 11, 12 and size 13 equine fusion SLIM shells. You may need to order two Equine Fusion Fit Kits be it SLIM or REGULAR Equine Fusion. One to accommodate front feet and one to accommodate the rear feet. Please note you will be responsible for returning them to us at your cost, and we are not able to refund you until the kit is received by us so we do recommend a recorded method of postage. Equine Fusion SLIM fit kits that are returned to us with parts missing, broken or dirty will be refunded less the cost to put them right again. Postage to send the Equine Fusion SLIM Hoof Boot shells is non refundable. 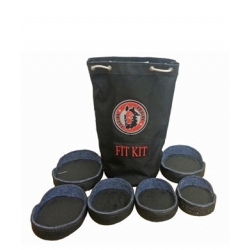 The Equine Fusion SLIM Fit Kit allows consumers to fit their horse's feet in the Equine Fusion Range of hoof boots before ordering, to ensure the best fit possible without the hassle and wasted time of buying and returning multiple boots. Pre-fitting in the shell will ensure a perfect fit in the Equine Fusion Range of hoof boot models and is especially helpful if your horse is between sizes or has one foot a slightly different size to the other. Equine Fusion Hoof Boot SLIM Range are available in the following sizes - Please See Size Chart Below! Compare your measurement with the Equine Fusion SLIM size chart above. Please note our Equine Fusion SLIM size charts are in millimeters only. Your measurments will determine which size fit kit you need. For example, if your horse’s hoof measurements call for a size 12, order a 11, 12 and size 13 Equine Fusion SLIM shell. Keep in mind that most horses require larger boots on the front feet. You may need to order two Equine Fusion SLIM Fit Kits or you may need to order two Equine Fusion Fit Kits be it SLIM or REGULAR Equine Fusion. One to accommodate front feet and one to accommodate the rear feet. When the shells arrive, try them on the horse’s feet to determine the perfect boot size. The perfect boot size can be placed under the hoof, your horse or pony should not be standing over the edge of any part of the shell. The boot shell will be in semi close contact around the hoof wall and no major gaps evident. The Equine Fusion SLIM's due to the way the boots fasten can accomodate a complete range of hoof sizes compared to other hoof boots. Large gaps being visible around the outer hoof wall to the edge of the shell. So you can almost twist the boot shell around the outer hoof wall. The shell is being trodden over on the edges so the hoof outer wall is not sitting within the shell. Using the Equine Fusion comfort pads will give more internal traction and comfort within the boots as well. For any assistance with choosing the right type and size of Equine Fusion Hoof Boot please do not hesitate to email us on sales@urbanhorse.com or call us on 01434 422700 - We are here to help you find the right boot for your horse / pony!